Multiple keratocystic odontogenic tumors: Insight to a rare syndrome? Nevoid basal cell carcinoma (BCC) syndrome is a rare syndrome caused by mutations in PTCH1 gene and characterized by several developmental anomalies and neoplasms affecting multiple organ systems. Conventionally, the syndrome was described as a triad of multiple BCCs, keratocystic odontogenic tumors (KCOTs), and bifid ribs. However, recently, we encountered a 25-year-old male patient who presented incidentally with multiple KCOTs, bifid ribs, and other characteristic findings, but not BCCs. This case along with appropriate literature review is being presented herewith. Nevoid basal cell carcinoma syndrome (NBCCS), though first recognized in 1894 by Jarisch and White, became popular as Gorlin-Goltz syndrome (GGS), after Dr. Robert Gorlin, who elaborated the clinical features in 1960. Prevalence of this rare condition varies between 1/57,000 and 1/256,000 people with equal gender predilection. GGS is caused by mutations in genes encoding key proteins, especially PTCH1, encoding protein patched homolog 1 in the Hedgehog signaling pathway, controlling growth, and development of normal tissue. This condition is transmitted as an autosomal dominant trait with complete penetrance and variable expressivity. Due to the variable expressivity, all the classic features may not be present in all cases, complicating the diagnosis. We highlight the importance of the early recognition of this syndrome through the present case report. Diagnosis may be established through the recognition of few major and minor criteria, thus increasing the chances for better overall survival rates and prognosis. A 25-year-old male patient reported to us, with the complaints of multiple broken teeth in the front maxillary region for 6 months. The patient initially noticed blackening of teeth followed by gradual chipping off, leading to the present status. There were no associated symptoms of sensitivity, pain, swelling, fever, or malaise. Noting certain abnormal facial features, we enquired in detail about his prenatal and family history. He was product of nonconsanguineous parents, at 40 weeks of gestation after an uncomplicated pregnancy. He was not mentally challenged and was pursuing Bachelor of Technical Education. The patient stated that his father expired 2 years back due to skin cancer and three of his siblings had similar facial features. His medical history was unremarkable. He had a habit of chewing tobacco with slaked lime by placing it in the lower labial vestibule for the past 4 years. 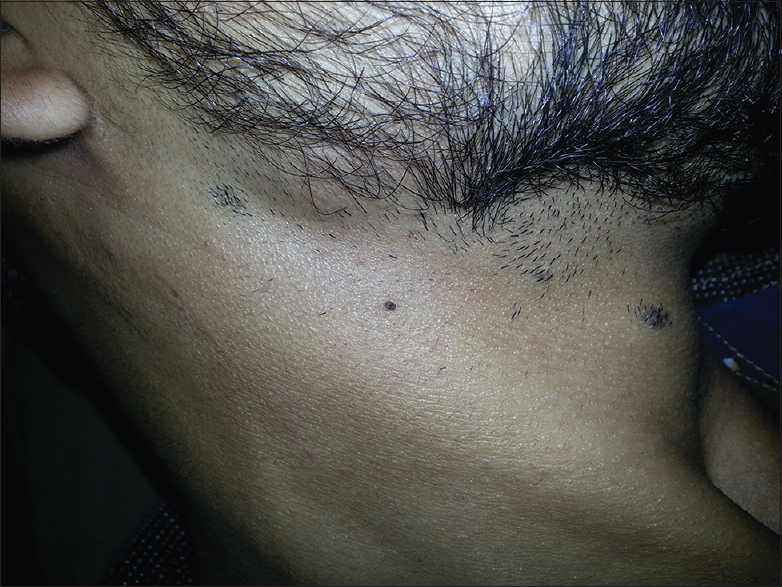 On general examination, multiple bluish black nevi with multiple hair arising from the surface were seen in the lateral surface of neck, arms, and back [Figure 1]. 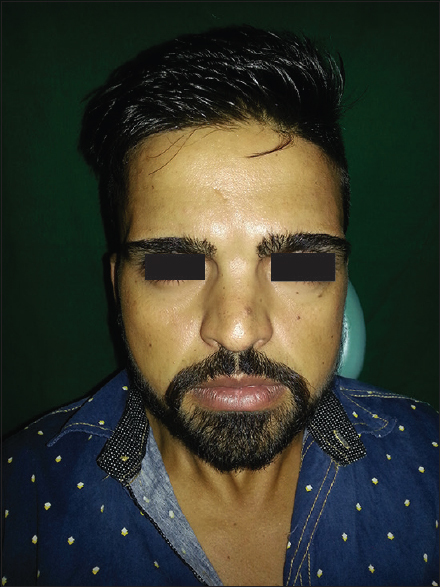 Characteristic facial features including frontal bossing, prominent supraorbital ridges, hypertelorism, sunken nasal bridge, and maxillary hypoplasia were noted [Figure 2]. Palmoplantar pitting was evident. 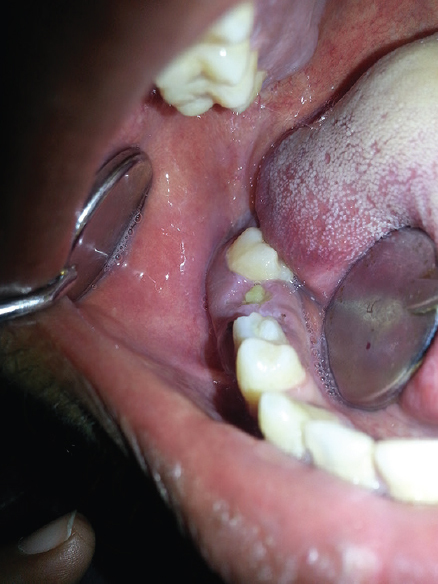 An intraoral examination revealed root stumps of maxillary anterior teeth, 37 and 46. 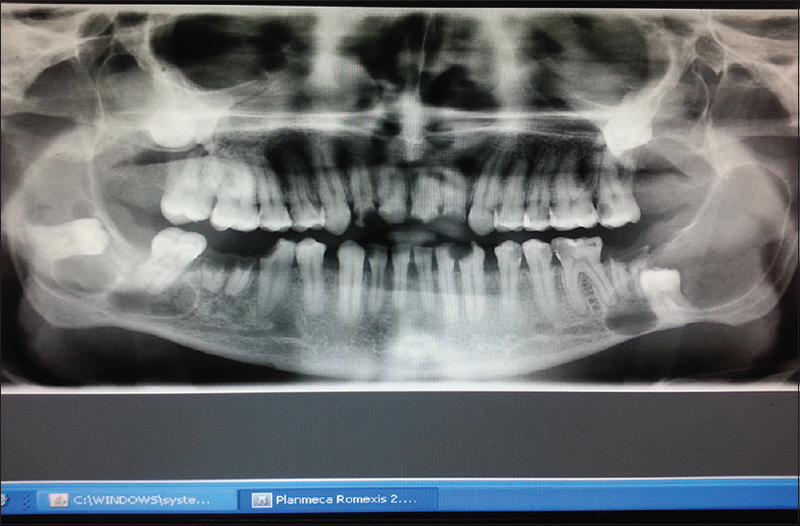 Incidentally, we observed two swellings bilaterally in the mandibular posterior regions. A diffuse swelling was seen with respect to the gingiva of 37, 38, measuring approximately 2 cm × 1 cm in size, extending from distal of 36 till retromolar pad area with minimal buccolingual expansion. The swelling was associated with missing 37, 38 and had a bluish hue. Another diffuse swelling was seen with respect to 46, 47 measuring approximately 3 cm × 1 cm, extending from distal of 45 till distal of 47 with obliteration of buccal vestibule, associated with lingual tilting of 47 [Figure 3]. Color of the swelling was same as adjacent mucosa. 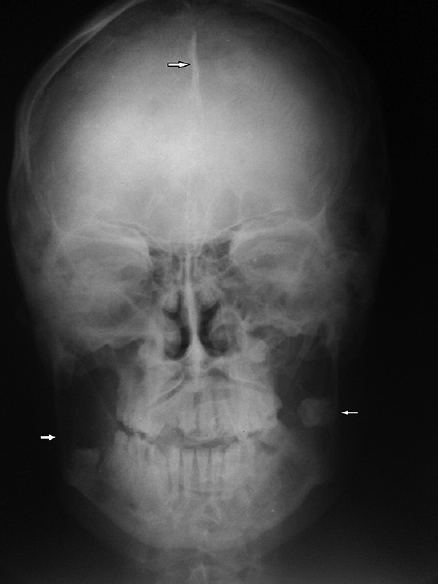 Surface of both swellings was smooth with no evidence of draining sinuses or visible pulsations. On palpation, both the left and right mandibular regions were tender, firm in consistency, nonfluctuant without palpable pulsations. Aspiration could not be performed as the patient did not consent for the procedure. Based on the above findings, provisional diagnosis was given as chronic apical periodontitis with respect to maxillary anteriors, eruption cyst with respect to 38, and radicular cyst with respect to 46. Radiological survey with an orthopantomograph revealed multiple well-defined radiolucent lesions on both sides of the maxilla and the mandible [Figure 4]. Right mandibular region showed corticated multilocular radiolucency with soap bubble appearance extending superoinferiorly 5 cm below coronoid notch up to inferior alveolar canal, anteroposteriorly from distal aspect of 46 till 1 mm anterior to posterior border of ramus. Inferior alveolar canal was displaced inferiorly and 48 was seen floating in the cavity and displaced posteriorly. Left mandibular region showed unilocular radiolucency involving the entire ramus extending anteroposteriorly from the distal aspect of 36 till 2 mm in front of the posterior border of the ramus, superiorly from 4 mm below the sigmoid notch till the inferior border of mandible. Scalloping was noted in the inferior border of the lesion. Apical displacement of 38 and interatrial communication was evident without root resorption or discontinuity of inferior border of mandible. Right maxillary posterior region showed unilocular radiolucency surrounded by thin corticated border of size 2.7 cm × 2 cm with respect to 18 region. Left maxillary posterior region showed unilocular radiolucency with scalloping surrounded by a corticated border. Skull X-rays showed calcification of falx cerebri on posteroanterior view [Figure 5] and bridging of sella on the lateral cephalogram. 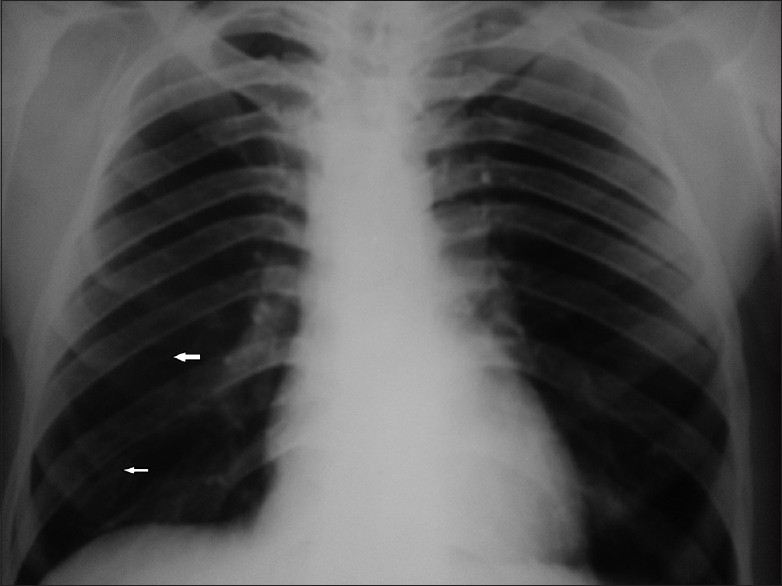 Anteroposterior view of the chest showed the presence of a bifid 5th and 6th rib on the right side with splaying of multiple ribs on the left side [Figure 6]. 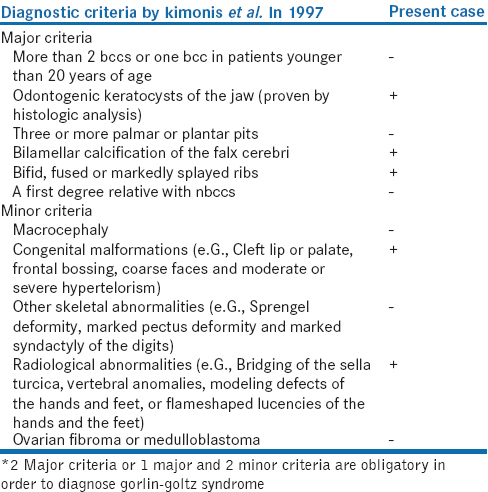 Final diagnosis of GGS was arrived at based on the presence of minor and major criteria given by Kimonis et al. in 1997. Two major criteria or one major and two minor criteria are obligatory to diagnose GGS, while our patient presented with four major and two minor criteria [Table 1]. Despite repeated counseling about his condition and necessity of further workup, unfortunately, our patient denied any further investigation or referral to other specialists. NBCCS has autosomal dominant inheritance with complete penetrance and variable expressivity. About 35%–50% represents new mutations. The gene has been mapped to chromosome 9q22.3. It consists of 23 exons with 12 transmembrane spanning domains and two large extracellular loops. While deletion of this gene results in mental retardation, mutation results in developmental anamolies and neoplasms. The gene PTCH, which modifies the Hedgehog signaling pathway, is mutated not only in the syndrome but also in isolated BCCs. Patched, a transmembrane gene in the absence of its ligand, sonic Hedgehog, acts as a cell cycle regulator, normally inhibiting expression of downstream genes (smoothened, among others) which control cell fates, patterning, and growth. In accordance with the Knudson two-hit hypothesis, the gene of one homolog gets lost from inherited point (germline) mutation and loss of the second homolog occurs by mitotic nondisjunction, deletion, or mitotic recombination, i.e., random somatic events. Various physical anomalies of the brain, ribs, vertebrae, and limbs apparently need only one hit. The single germ cell hit may account for the malformations and their variability in NBCCS patients. 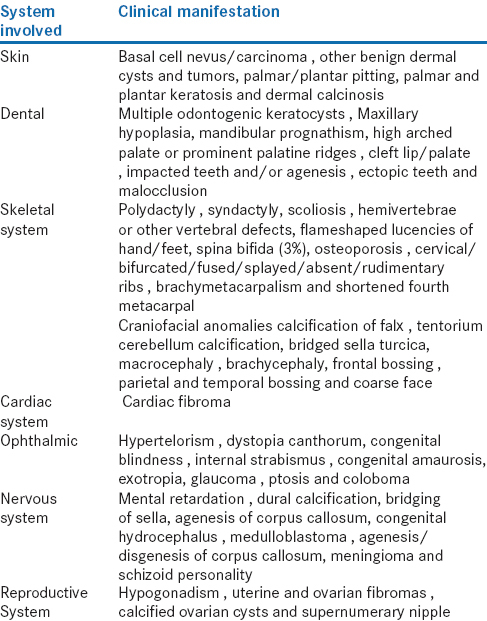 The spectrum of clinical features of this condition is presented in [Table 2]. 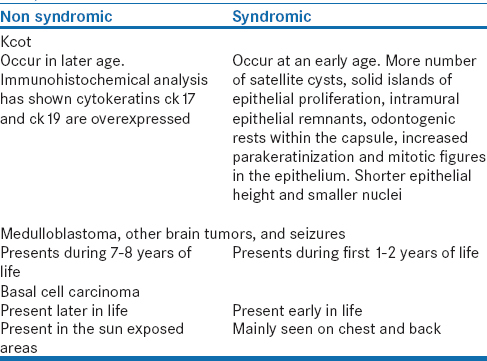 Differences between certain features occurring in syndromic and nonsyndromic patients are enlisted in [Table 3], which might be important considerations for their better management. Genetic analysis of patients is important to counsel them regarding transmission of abnormal traits, such as PTCH1 mutation to their offspring. Prenatal analysis for GGS can be performed in early pregnancy by an ultrasound scan for the detection of cardiac tumors, enlarged head, or developmental anomalies such as cleft palate or DNA analysis from a chorionic villus biopsy or an amniotic fluid sample. Early detection of the syndrome makes it possible to minimize the childhood and adult complications related to GGS. Management of GGS requires a multidisciplinary approach because of the multiple organ-related anomalies are enlisted in [Table 3]. Recently, drugs have been developed to block Hedgehog signaling, such as the Hedgehog pathway inhibitor, vismodegib. The drug is licensed for use in advanced basal cell cancer and there are on-going trials in the treatment of medulloblastoma. Management of KCOTs is planned according to their aggressiveness and age of the patients. Conservative management should be considered first in young children because an aggressive operation can have an adverse effect on teeth development, eruption process, and development of the involved jaw. KCOT exhibiting particularly aggressive clinical behavior (e.g., growth, destruction of adjacent tissues) requires resection as the surgical treatment. Dentist, especially oral radiologist, has an important responsibility particularly when interesting incidental findings are encountered. Timely diagnosis and referral to other specialists for further evaluation may prevent unwarranted complications. A multidisciplinary team comprising pediatricians, specialists in genetics, maxillofacial surgeons, dermatologists, cardiothoracic surgeons, ophthalmologists, gynecologists, etc., is required for the management of the syndrome. Regular follow-up by specialists should be carried out for monitoring these patients. Hahn H, Wicking C, Zaphiropoulous PG, Gailani MR, Shanley S, Chidambaram A, et al. Mutations of the human homolog of Drosophila patched in the nevoid basal cell carcinoma syndrome. Cell 1996;85:841-51. Evans DG, Farndon PA, Burnell LD, Gattamaneni HR, Birch JM. The incidence of Gorlin syndrome in 173 consecutive cases of medulloblastoma. Br J Cancer 1991;64:959-61. Manfredi M, Vescovi P, Bonanini M, Porter S. Nevoid basal cell carcinoma syndrome: A review of the literature. Int J Oral Maxillofac Surg 2004;33:117-24. Yamamoto K, Yoshihashi H, Furuya N, Adachi M, Ito S, Tanaka Y, et al. Further delineation of 9q22 deletion syndrome associated with basal cell nevus (Gorlin) syndrome: Report of two cases and review of the literature. Congenit Anom (Kyoto) 2009;49:8-14. Acocella A, Sacco R, Bertolai R, Sacco N. Genetic and clinicopathologic aspects of Gorlin-Goltz syndrome (NBCCS): Presentation of two case reports and literature review. Minerva Stomatol 2009;58:43-53. Mamatha GP, Reddy S, Rao BB, Mujib A. Gorlin syndrome. A case report. Indian J Dent Res 2001;12:248-52. Mauduit G, Plauchu H. Gorlin-Goltz phacomatosis: ophthalmological aspects About a case. Lyon Med 1982;247:353-8. Lench NJ, Telford EA, High AS, Markham AF, Wicking C, Wainwright BJ. Characterization of human patchedgerm line mutations in naevoid basal cell carcinoma syndrome. Hum Genet 1997;100:497-502. Shimkets R, Gailani MR, Siu VM, Yang-Feng T, Pressman CL, Levanat S, et al. Molecular analysis of chromosome 9q deletions in two Gorlin syndrome patients. Am J Hum Genet 1996;59:417-22. Levanat S, Gorlin RJ, Fallet S, Johnson DR, Fantasia JE, Bale AE. A two-hit model for developmental defects in Gorlin syndrome. Nat Genet 1996;12:85-7.